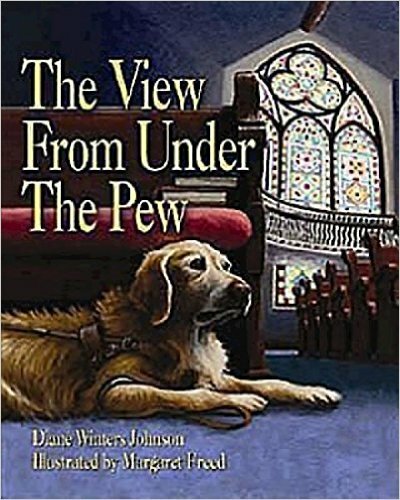 Summary: This nonfiction book is about a Seeing Eye dog, Walter, who works with Pastor Diane as she seeks to do ministry each day. Walter was with her in seminary, when she was ordained, and each day as she serves the church. Walter has the opportunity to help Diane and be part of the church too. Walter goes everywhere with Diane as she leads meetings, leads Bible studies, attends choir rehearsal and leads worship. He likes his view from under the pew because he gets to see all the families that come to worship together and is proud to work in ministry with Pastor Diane. Literary elements at work in the story: The View from Under the Pew has beautiful painted illustrations that are full of color and vibrancy. The combination of vibrant illustrations with the descriptive writing style makes for a wonderful story fitting for young and older readers alike. How does the perspective on gender/race/culture/economics/ability make a difference to the story? Diane’s visual impairment is central to the storyline and the understanding of church in the story. The congregation is primarily made up of Caucasian members but there are a few instances of other images of diversity. Individuals of every gender and ability would relate to this story! Theological conversation partners: God calls us with our whole selves to follow God’s call for our lives. Each of us may have different gifts and called to various types of ministry but nonetheless, we are all still called to glorify God in that call. Diane was called to the ministry of being a Pastor. Walter was called to be a Seeing Eye dog and both he and Diane are living out their calls faithfully. They are part of the body of Christ that recognizes our individual calls and our communal call. God calls ordinary men and women in scripture to do extraordinary things. Can you think of anyone that God asked to do something? Sometimes God uses things that we are good at to do remarkable things. What are you good at? Now, a hard question. How do we know that God wants us to do something? How do we know we are called for a task? The View from Under the Pew by Storypath is licensed under a Creative Commons Attribution-NonCommercial 4.0 International License.